A short month (as February’s tend to be) but full of interest and all round good stuff. Richardson really does write up to the moment, and the truth of the moment. The part of the book when Clarissa talks about coming back to her house after a few weeks away to find her reception to be somber, serious and worst of all, formal; really put the shivers down my spine. The scene where it is revealed to her that she is to be married to Solmes was brilliantly observed and described, each character in the room had different emotions, all of them restrained, but at the same time their behaviour showed those emotions. The way Clarissa’s mum shy’s away, the sternness of the father, the way the aunt is trying to use her eyes to apologise, the smugness of brother and sister - each character is there and accurate. The whole scene is full of this reined in, pained and somber in the way serious family conferences tend to be, and we know that it is the start of Clarissa’s nightmares to come. “They have all an absolute dependence upon what they suppose to be meekness in my temper. But in that they may be mistaken.” When comparing this statement, and Clarissa’s general demeanour in this chapter with someone in a similar position, like Sophia Western, forced to marry Blifil in Tom Jones, it is clear how strong the complex and real nature of Clarissa and her family are. Where Squire Western rants and rails amusingly, and Sophia sobs, cries and then slips out with her maid - the quiet but solid independence of Clarissa, and the icky loading of guilt and pressure from the Harlowe family is a much more realistic portrait of this kind of position. I also enjoy the attention to emotional detail, as Clarissa becomes more embroiled in whatever schemes are around her, she starts to take more notice in the language people are using to her. Noting down her sister describing her acts as ‘witchcraft’ and repeating phrases the whole family are using to sound as one. There is also the attention to detail as she both hates her brother and sister, tries to excuse their actions and also feels guilty for saying bad things about them. This is especially poignant when she talks about her Mother’s own meekness and wish to avoid confrontation is proving to be one of her biggest betrayals - how the pain of her Mother’s betrayal is compounded by the guilt of believing her Mother could betray her. However, Clarissa’s voice is nothing compared to Anna Howe’s. Miss Howe is a brilliant voice, lively and sparky and self possessed. I love the way she banters with Clarissa, taking the piss and generally speaking plainly. She believes that, “A friendship like ours admits no reserves”, and she is certainly blunt. 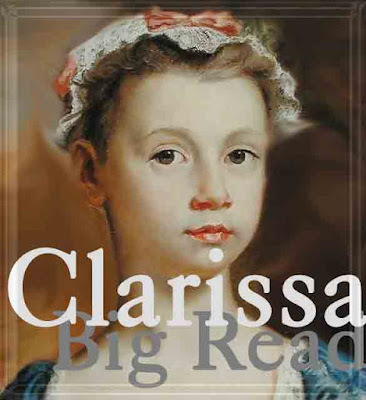 First she tells Clarissa that she’s a patsy, “You are so tender of some people, who have no tenderness of anybody but themselves.” She doesn’t hide the fact that she regards Clarissa’s family to be “The absurdist family in England,” and that she has no time for all their machinations. I love how rude she is, saying that nobody could ever love brother James and that sister might have been alright, “Had she been good-natured, as your plump ones generally are.” I thrill to her bitchiness, and the proper and correct tone these characters share, both in light of their individual characters and the closeness of their relationship. I also love Miss Howe’s self assurance, that she only copes with Hickman because he is polite and knows how to keep his distance and that although her own mother frequently wishes she was as sweetly obliging as Clarissa but that she herself was thankful for her ‘sauciness’ as it meant that she couldn’t be manipulated as Clarissa is. Finally I like the way she teasingly, but clearly reveals the hints in Clarissa’s letter that reveal that she might indeed have a soft spot for Lovelace which could grow...much to the family’s displeasure. Wonderful post - I really enjoyed reading your thoughts. Anne was definitely a breath of fresh air that ended this short month on a high note. looking forward to what March will bring. I agree, I am finding Miss Howe far more engaging than I thought she would be. It's clear Clarissa needs someone to defend her interests, so maybe Miss Howe has a bigger role to play in coming months! Oh my. That family scene. It was very vivid for me. I love it that you have other 18th c. authors to compare this one to! Clarissa is growing on me as well. I'm glad she seems to have more going on that just this saintly, innocent aspect, although she's still that. I could just see that getting annoying if she didn't have any backbone. In Richardson's Pamela, Pamela starts to grate on your nerves, so hopefully Clarissa will stay interesting and become more layered.